The mintmarks of H and KN appear on some of the pennys of George V. The H mark appears also on pennys, halfpennys, and farthings of Victoria and is in the same place on all three denominations. The H stands for Ralph Heaton and Sons of the Birmingham mint, whereas KN refers to King's Norton Metal Company. 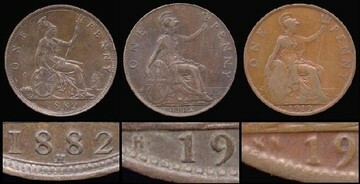 On the coins of Victoria, the H mark is below the date on the reverse. On coins of George V, the H and KN marks are to the left of the date on the reverse. Coins with these marks are worth more than their unmarked counterparts. For George V, the 1912H is somewhat more common than the 1918H and 1919H. The 1918KN and 1919KN are a bit more uncommon than the H varieties of the same dates.